Am I above using chocolate chip cookies as bargaining tools to draw in new visitors? Not at all. And what could possibly be more alluring than chocolate chip cookies...massive chocolate chip cookies? Instead of breaking teeth, these will only leave a massive crack in any potential diet plans to wear a bikini this summer. As you can see, they are massive. Thanks to that buxom circumference, there are large amounts of chocolate and nuts (if you so desire) in every bite. But what about that ever important element, the texture? No worries. 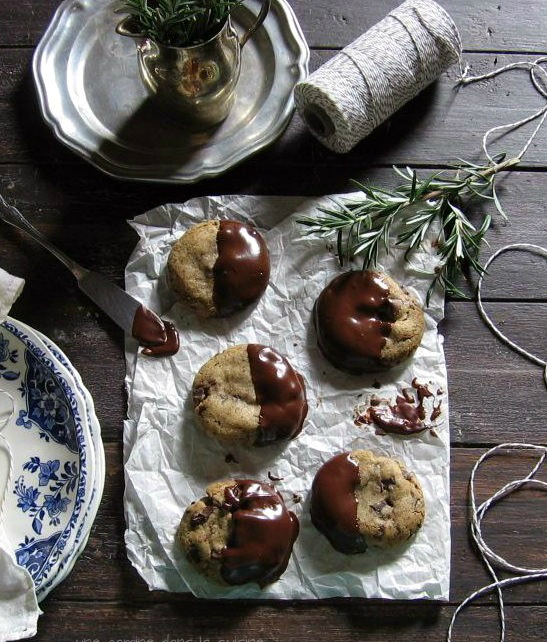 These chocolate chip Frisbees are heart breakingly soft and chewy. Can you see how thick they are? Normally cookies this thick are too cakey. But these are magic cookies. They have a slight cakiness that is so rapidly overtaken by the gooey chunks of chocolate, you won't even notice, or care. I also added an Une Gamine staple by substituting pure almond extract for vanilla. This, along with the density, offers an almond paste-like flavour. Undeniably addicting. If these were handed out to teenagers, they would be waving around whisks and spatulas at rave parties. With regards to these cookies, my sister, upon eating her 4th one, asked if crack was the key ingredient. Dieters, beware. 1 cup (two sticks) unsalted butter, at room temp. In a large bowl, beat butter and both sugars just until they come together. Be careful not to overbeat. Add the eggs and almond extract, beat just until incorporated. In a seperate medium-sized bowl, whisk together the flour, salt and baking soda. When thoroughly mixed, add to batter and stir just until blended. Stir in chocolate chips and nuts. The dough should be neither sticky nor dry. Cover the bowl and refrigerate the dough for at least 8 hours (sorry) or overnight. Divide dough into about 12 mounds, but keep the mounds 'rugged', don't over-work the dough. If the mounds become too soft from the heat of your hands, place them in the refrigerator for about 30 minutes. Preheat the oven to 350 F. Place the cookies on an ungreased insulated cookie sheet or an upside down rimmed cookie sheet. Sprinkle each cookie with a little kosher salt (if using.) Bake for *15-20 minutes (check after 13 minutes.) The won't look like they are done but if you leave them on the sheet for at least 10 minutes, they will be perfect. These are great as soon as they are cool enough to eat, but they are spectacular the next day! If you can wait that long. I don't know. It is different now with this crappy economy! Speaking of that, Hawaii has one of the best economies right now and there are pirates there (smile) and tons of places to work. Ooh, I just wrote a novel. Sorry. not only are those huge cookies....but they look like the best chocolate chip cookie I have ever seen!!! These cookies look fantastic!! I've never wanted a chocolate chip cookie as much as I do now. Oh wow- these look like something out of my dreams!!! 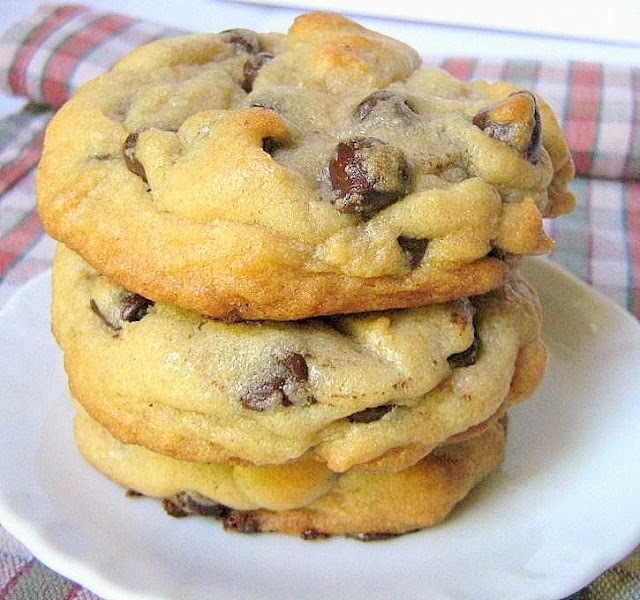 I feel like I've made about 8,000 different recipes for chocolate chip cookies, but somehow, these are new to me! I'll most definitely be trying these out soon!! What a great recipe and post and pictures! You're so talented. Do you think these would freeze well? If I bake them and don't freeze them, well, I'll eat them all and that would be very bad. You'll make it to your goal. You will. If you put it out there, it will happen. These cookies look great, so glad I found your blog! Amy, it amazes me how many recipes are out there. And like a moths to a flame, bloggers simply must try them. You could freeze the cookies once they are molded, just be sure to wrap them up well and put them in an air-tight container. Once they are baked though, I think the best you can do is find people willing to eat them for you (shouldn't be too hard Or if you're short like me, put them in a high pseudo hiding place that's not worth the climb. Well I know what I'll be baking this weekend! Thanks, I have a favorite cc cookie recipe- but if this is as good as it looks I might have a new one! Hi, Abby! Please let me know how these turn out if you decide to make them. And I'm curious/nosey about what your fav. recipe is? Valerie, these look absolutely perfect. I will bet they were delicious. And you have inspired me again...I have never used almond extract before, but it sound like it adds an interesting twist. I will have to give this a try. Thanks! If anything can get you on that boat, Valerie, these can! Love the almond flavoring! Super big, super delicious. I'm a crispy lover, but I'm not averse to other kinds of cookies. And I have a bag of bread flour. Hmmm. These look amazing; I love your idea and plea! I hope it works for you! Oh yea, these are going on my "to bake" list. Wow, those look fantastic! Perfection! Mmm these are like Levain copycats! I love almond extract, so I'm sure these were amazing! Holy cow, these cookies look amazing. I think you totally got the cookie science down - I love that diagram! Explains everything quite nicely. Man, I really hope the Northwestern peeps see your blog. They don't know what they're missing out on! Thank you, Ms. Meanie. :) I hope so too. These cookies are so large, maybe their reach will be farther than some of my other posts. I wish I could help with the job. You can put a picture of these on your CV, you'll be sure to land it. 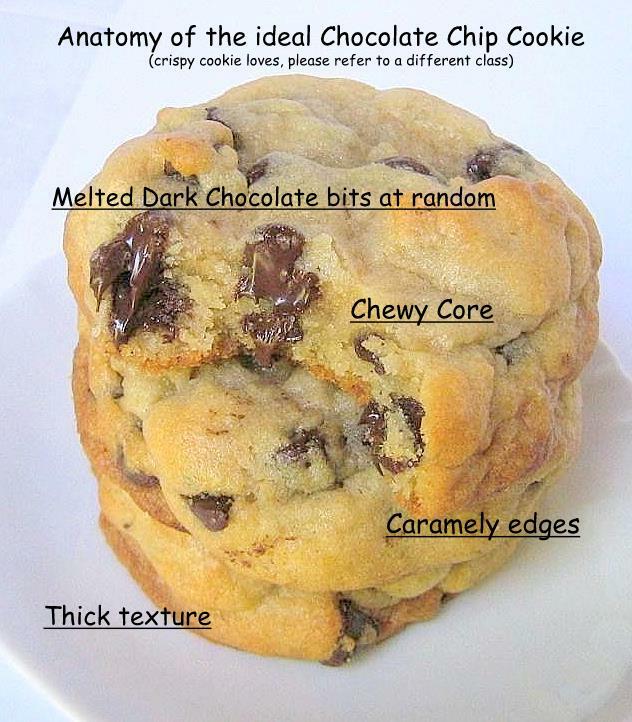 I usually don't like cakey soft cookies, but this looks delicious. And I can't help but laughing at teens partying with whisks and spatulas! My kind of cookies. It interesting that you use bread flour. Good luck with the job hunt, these cookies are a great enticement. Would you happen to know what stance Sig takes on that issue? These look amazing! Can't wait to try them out! Can you use regular flour or do you have to use Bread Flour? I never even knew there was such a thing! Oh my golly gah GAH those look good!!! I think you may have found (what looks to be) the perfect chocolate chip cookie. Need to try these asap. Keep up the good work! Follow your dreams!! I secretly aspire to go to Hollywood and become an actress. ;) But I would love to just drop everything and open my own bakery in Alaska. Oh what it is to dream! And I have to say that these cookies are PHENOM! I made them hoping that they'll be what I wanted/needed out of a chocolate chip cookie and I burned two batches but the third was perfect!! I was so happy that I managed to eat three and spoil my appetite for dinner ;) Thank you!! Hi, Jeannette. 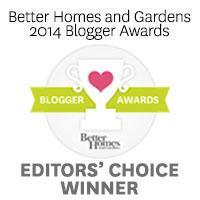 Thank you for the encouraging words! Your goals seem perfectly attainable, perhaps we will run into eachother in Alaska someday. ohhh man, do i want some of these right now. 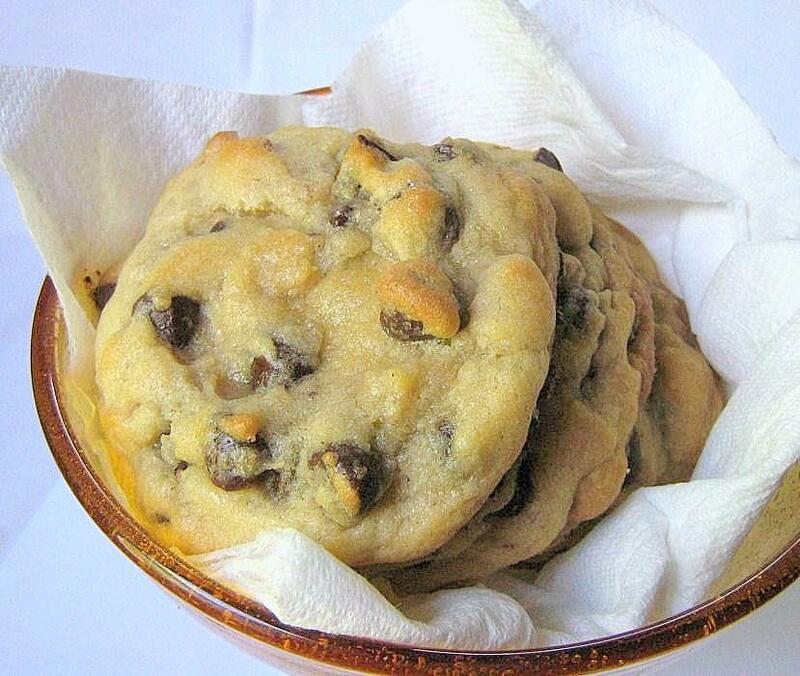 I wanted to Thank you for sharing your amazing Colossal Chocolate Chip Cookie recipe with us. I made these tonight and could not keep my family out of the cookie jar! Everyone was 'swooning' while eating these cookies. They were so moist and chewy on the inside. With a thin, crispy outside. I had rolled them into balls before realizing you had said to leave them as 'rugged' mounds. Thought I might have ruined them, but they were absolutely delicious. Thank you again for this wonderful recipe we will be enjoying again for sure!!! Thanks for visiting and for the lovely comment!